Ah, weddings… if there’s anything more beautiful than attending a ceremony of two people dear to your heart exchanging love vows and promises to stand by each other forever - we’d love to know what those ceremonies are and attend them immediately! 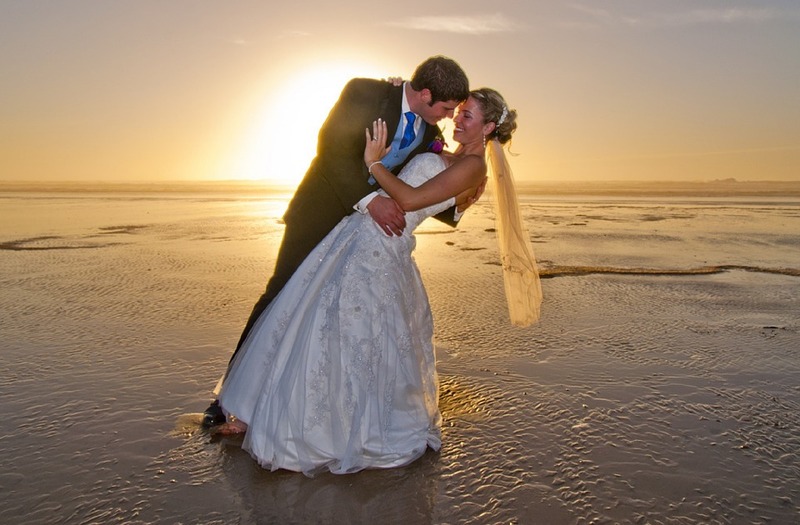 For all the romantics out there, weddings have a special sentimental value and are not just the time two people join in marriage but are a unique opportunity to celebrate the power of love, altogether. And, ultimately – honor it with the right fashion! Attending a beach wedding is just a tad specific when it comes to picking out the right outfit; you don’t want it to be too tight or too casual, you don’t want to seem overdressed but you also don’t want to look washed out or plain. And what about all that heat! You definitely want to prevent all the excessive sweating or at least wear something that won’t let it show! To take your troubles away, we’ve put together a list of fashion choices that will let you stay comfortable during the beach wedding and yet - stay absolutely fabulous! 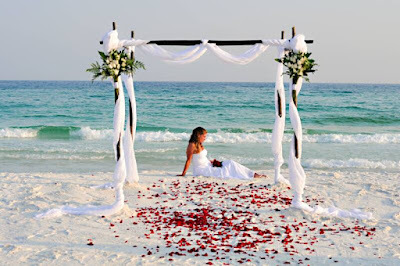 Beach weddings are all about that sense of ease and lightness; nothing that feels too tight or too constrained belongs on a beach, and you need to honor that with your fashion choices. Instead of going for a body-con dress (you’d probably wear), we’d advise you opt for a flowy, maxi strapless (or strappy) dress or even a knee-length cut one. Opt for either volume or clean silhouettes as both work perfectly with the summer relaxed vibes. Materials to go with are lace, linen, silk, georgette, cotton, mesh and every other material that feels good on the skin and breaks the body line. While black is an all timer it simply feels unnatural when worn during hot summer days. Instead, opt for beige, white, champagne, pastel shades like baby pink, light blue, lavender, yellow, mauve… and all other colors that make you smile! Also, don’t be shy on fabric ornaments like glitter, pearls and tiny diamonds. Obviously, you don’t want to be a walking circus so don’t overdo on the bling bur rather channel it so it looks rich, luxurious but tasteful. 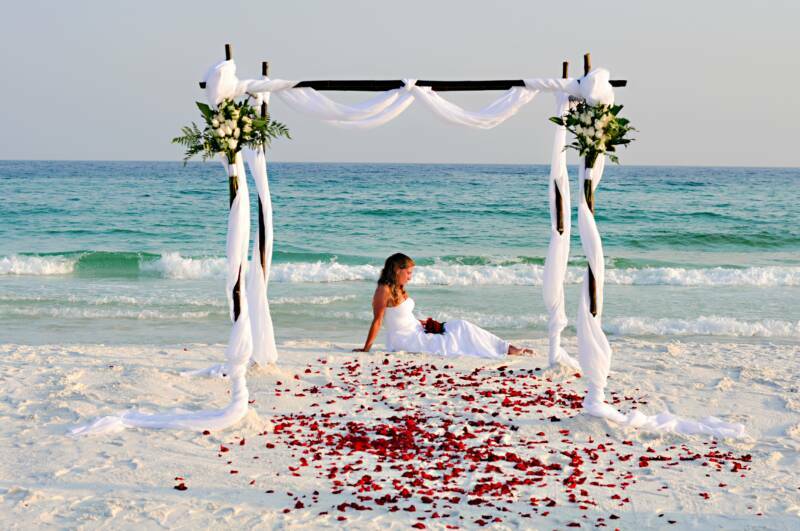 Prints, graphic prints, florals and other patterns also work beautifully with a beach wedding attire. The first instinct is to go with a pump, right? Well, think twice! A downside (sort of) to a beach wedding is that all that sand is getting in the way of your showing off that pair of shoes you’ve recently bought. However, there’s always the option of choosing a refined, sleek gladiator knee sandal that will perfectly match your easy dress and let the edgy side of you show. You can go for a ballerina shoe, too – as long as they don’t look too sporty. Oh, and most importantly – ladies, no heels! While we absolutely understand you want to look uber stylish when you show up at that luxurious outdoor Sydney wedding venue, the sand will kill the thrill. Sorry! As for men, they shouldn’t show up in a sandal; so far there hasn’t been a male sandal designed to fit an elegant occasion, so instead - guys should go for loafers or a sleek low top sneaker. The bigger, the better! Summer is all about letting your inner diva show, and is there a better way to let her glow than by letting her enjoy all the amazing array of neck statement pieces, earrings, bracelets, cute waist belts, hats with wide brims, hairbands, turbans and large sunglasses you’ve been keeping aside for all the upcoming elegant occasions! Again, mind your taste and don’t overdo it – pick a few statement pieces that agree with your dress and your overall style, and enjoy everyone turning heads! 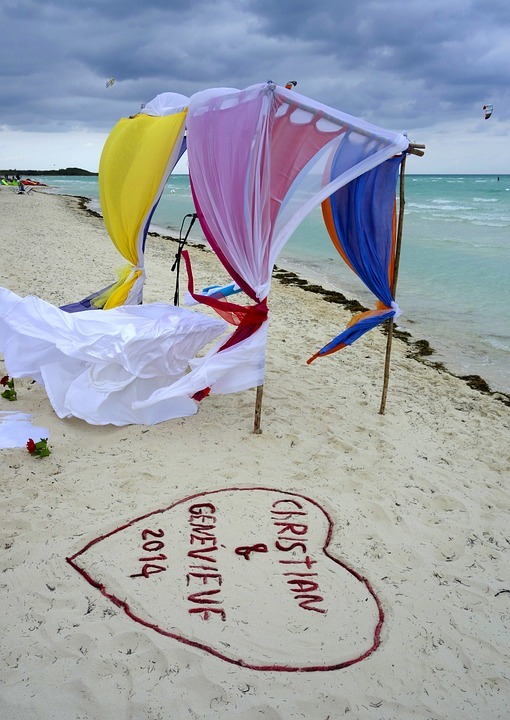 We definitely hope our suggestions were of help and that you’ll have a wonderful time at that upcoming beach wedding!